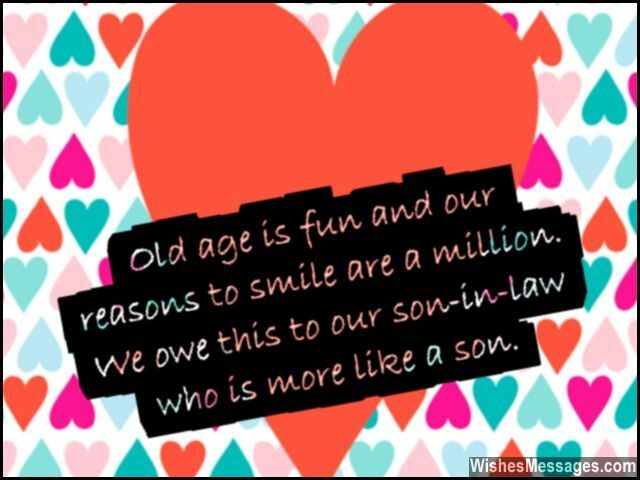 Birthday Wishes for Son-in-Law: Does your son-in-law treat you more like his parents than in-laws? Does he do everything to keep your daughter happy? Celebrate his birthday by showing him your love and appreciation. Plan a dinner and get your family together. Raise a sweet toast to your son-in-law and let everybody know how important he is to your family. Find the quiet moment when you can give him the gift and greeting card you bought him. If you are not going to be able to see him, post a funny quote on his Facebook or share a cute family picture on Instagram along with a beautiful wish. Your actions will make him feel that you don’t just see him as your daughter’s husband, but as your very own son. 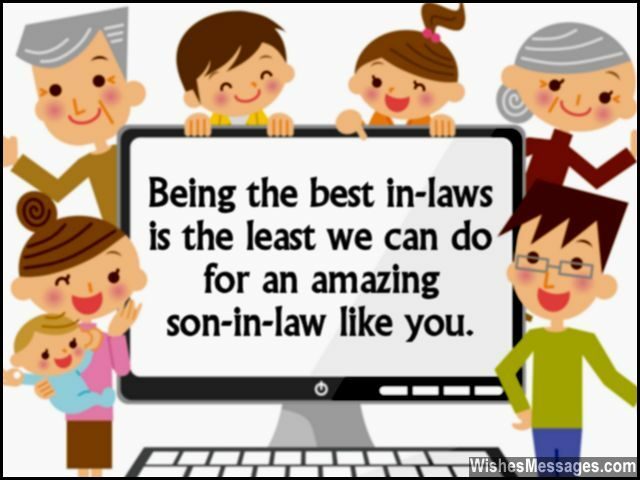 1) Being the best in-laws is the least we can do, for an amazing son-in-law like you. Happy birthday. 2) Even the most expensive gift in this world is insignificant in front of the gift you have given us by being an awesome son-in-law. Happy birthday. 3) For you, we are more than just parents-in-law. For us, you’re more than just a son-in-law – we hope this mutual admiration continues forever. Happy birthday son. 4) We gave our daughter a fairy tale wedding, but you gave her a fairy tale life. Happy birthday. 5) My daughter has inherited my taste, which is why she picked a gentleman like you to be her husband. Happy birthday. 6) My daughter found her life partner in you, my son found a brother in you and we found a second son in you. Happy birthday. 7) My daughter was not the only one who fell in love with you at first sight, we did too. Happy birthday. 8) Our daughter converted all her wrongs into rights by marrying an amazing man like you. Happy birthday. 9) Although you were not born into our family as a son, you have become more than a son for us. Happy birthday. 10) Thanks for always treating me like your own mother. An awesome son-in-law like you, I’d never find another. Happy birthday. 11) Karma finally set everything in our life right by giving us a son-in-law like you. Happy birthday. 12) Our daughter made some horrible choices when she was young, but then she made up for all of them by getting married by you. Happy birthday. 13) Our daughter is not the only one who’s lucky, we all feel blessed for having you in the family. Happy birthday. 14) Do you know those perfectly happy families they show in commercials? That’s us. Happy birthday to a perfect son-in-law. 15) If not for that ring on your finger, we would never remember that you are our son-in-law. Happy birthday son. 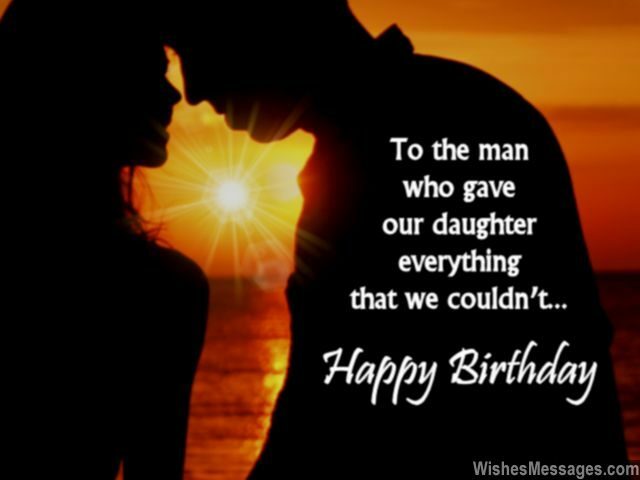 16) To the man who gave our daughter everything that we couldn’t – happy birthday. 17) By showing us so much love and respect, you have proved that we don’t need to add the word in-law after son. Happy birthday son. 18) May destiny fulfill all the dreams of the man who has fulfilled all the dreams of my daughter. Happy birthday. 19) It takes a thousand prayers and a million acts of kindness to get blessed with a son-in-law like you. 20) Addicted to happiness and obsessed with joy – we have become like this because of you, birthday boy. Happy birthday. 21) You became our son-in-law by chance, but our loving son by choice. Happy birthday. 22) You are our sun-in-law because you spread light and radiance in our lives. Happy birthday. 23) On a piece of paper, we’re related by law. But in our hearts, we are related by love. Happy birthday son. 24) May your birthday turn out to be like the life you’ve given our daughter – amazing. Happy birthday. 25) We just asked for our daughter’s well-being, but you ensured the entire family’s happiness. Happy birthday. 26) May life always bless you with strength, prowess and goof fortune – so that you can keep our daughter happy. Happy birthday. 27) The best sons-in-law come only to those who’ve reared wonderful daughters worthy of them. Happy birthday. 28) Our daughter got a prince and grandkids got a superhero. But we got the son we never had. Happy birthday. 29) Kings vanquish enemies, leaders sign treaties and superheroes triumph over evil. But sons-in-law like you just rule over everyone’s hearts. Happy birthday. 30) Thanks for understanding her dreams more than I could ever have. Happy birthday. 31) Old age is fun and our reasons to smile are a million. We owe this to our son-in-law, who is more like a son. Happy birthday. 32) I’m proud to see where my daughter is today, but I also know the reason why she’s there. Happy birthday dear son. 33) Happy birthday to the man who has been a pillar strong enough for the entire family to lean on. Happy birthday. 34) Families are incomplete, without sons like you who make life a treat. We love you son, happy birthday. 35) Daughters make families special, but sons-in-law like you make them extraordinary. Happy birthday. 36) I am glad that you were born, or else our daughter would be torn and we’d be so forlorn. Happy birthday. 37) If life is a chocolate cake, you’re the extra chocolate sauce on top which makes it delicious. Happy birthday. 38) Respect, admiration, love, appreciation, love – these are permanent birthday gifts from your father-in-law. Happy birthday. 39) A few years back, my daughter was the only one crazy about you. Now, everyone in the family is. Happy birthday. 40) There are some people who make their presence felt with the things they do instead of the words they speak – that person is you. Happy birthday dear son-in-law.